Kamui Kobayashi says Romain Grosjean should have been banned for more than one race for causing a first-corner crash in the Belgian Grand Prix. The Sauber driver was one of five drivers affected in the crash, in which Ferrari's Fernando Alonso narrowly escaped injury. Japanese driver Kobayashi said: "One race I was really surprised. I expected more than one race. "He has had seven crashes in 12 races. It's more than half. That's too much." Why do these guys want to finish in Turn One, or take so much risk in the beginning? Grosjean will miss this weekend's Italian Grand Prix as a result of the crash, in which he moved across on McLaren's Lewis Hamilton. 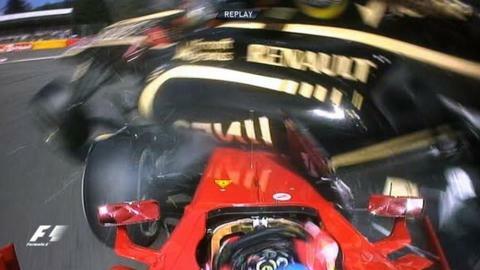 His Lotus was launched over Alonso's Ferrari and also took out Sauber's Sergio Perez. Kobayashi and Williams driver Pastor Maldonado were also hit but were able to continue. Kobayashi said: "Included in that (seven crashes), three times I had accident with him. It's not my fault. Always he crashes with someone." Maldonado is also under the spotlight after incurring seven penalties for driving incidents this year. He will be demoted 10 places on the grid this weekend after two separate incidents in Spa last weekend. "Why do these guys want to finish in Turn One, or take so much risk in the beginning?" Kobayashi said. "It is a long race and we don't know what's going to happen. If they want to finish so quick it is a bit of a surprise. Each person has their (own) characteristics. "People who have been a long time in F1, not so many crashes for them. A good example is Kimi (Raikkonen, Grosjean's team-mate). "He never takes risks in the beginning. But when I look suddenly he's on the podium. "This is a good example to his team-mate and hopefully he learns and gets back strongly in the next race, not here."